I’ve always been fascinated by the French Quarter in New Orleans. It evokes an anticipatory thrill of terror any mystery inside my chest. The city's popularity for fiction writers, especially the romance genre, hasn’t waned over the years. I can remember reading many historical romances in the 70’s and 80’s set in New Orleans. 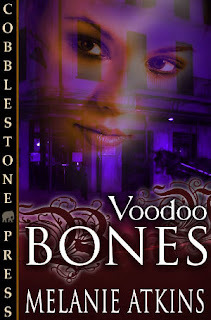 When Melanie Atkins advertised her novella, Voodoo Bones, I knew I had to read it. And I wasn’t disappointed! Voodoo Bones puts the reader there in that mysterious, haunting section of New Orleans. I smelled the area’s scents and felt myself living behind the voodoo shop with the heroine. I even found myself urging the heroine to move out of the place. LOL. Noel Galliano meets Detective Mathieu Bergeron when a dismembered body is discovered upstairs from Noel’s Voodoo Shop. The developing relationship between these two very likeable characters enhances this novella’s suspense. I read plenty of romantic suspense novels, but few give me shivers and make me uneasy when I read them in bed at night. This one did!